Manual which came with a Relay 153 Duplex slide rule. 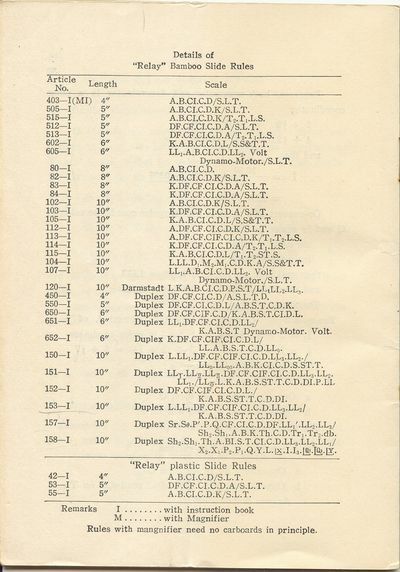 This manual also contained a catalogue of "Relay" bamboo rules which details the model number and the scales for each rule. Condition: Fair. The manual is worn and has a crease from being folded and stored in the box for many years. All of that in only 30 pages. Most of the sections are very brief and only briefly touch on some of the topics, many are just a single calculation or description of the usage and the user is expected to already have the basic understanding of what the author is describing.